Performance at KPFT's Free Music Store featuring Truett Tidwell, ARP synthesizer; Paul Bauer, guitar and ARP; Pat Brennan, mini-Moog; Rick Thigpen, flute and bass; and Jim Lemon, drums, playing avant-rock n' roll. During a tuning session, the audience and band members discuss technical details and specifications of the band's electronic instruments. Songs include Aorus; Soft; Mouthpiece; and a synthesized electronic jam. This recording was taped over an older tape, and includes a portion of an unidentified speaker performing John Cage's Sixty-Two Mesostics Re Merce Cunningham. 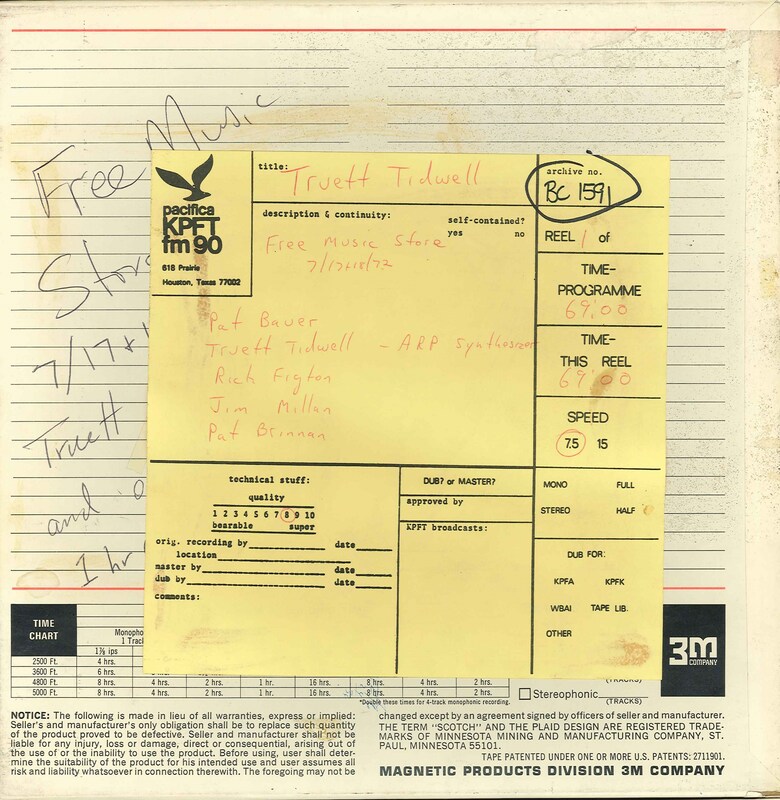 The Truett Tidwell performance ends at 01:08:58, at which point the Cage piece begins, in the midst of track 22. This recording was formerly cataloged as BC1572. 1 reel (69 min.) : 7 1/2 ips, mono.